Step 1. Cook pasta according to packet directions and leave in water until ready to use. Step 2. In a large bowl combine the parsley, breadcrumbs, salt and pepper. Step 3. Lift the wet pasta from the water and add to the bowl with olive oil and lemon juice. Toss together until well coated. Step 4. Add tomatoes and season well with salt and pepper. 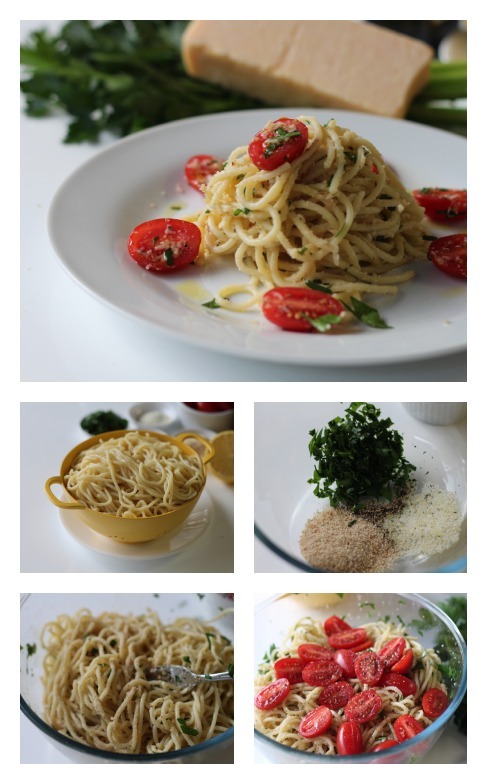 Garnish with parmesan cheese and serve. I gather the ingredients while the pasta is cooking and set the table so I can eat this warm. But it is also very nice cold. Instead of draining the pasta I like to lift the pasta from the pot and add it to the bowl so it's still wet. This helps to distribute all of the flavours. Perino tomatoes are small oval snacking tomatoes but any cherry or pear tomatoes will do the job, so long as they are ripe.